208 Touring Aircraft Desktop Wood Model Large. Dimensions: Length - 11.80" inches / Wingspan - 16.00" inches / Package Weight - 5.00 pounds. Material: Kiln-dried Mahogany - 100% Hand-crafted & Hand-painted. Stock Availability - Made-to-order FACTORY-direct. 4 weeks to make + 3 weeks Air Parcel Post to anywhere around the world. Mahogany Wooden Stand is included and detachable from the airplane model. We are a Verified Merchant. 208 Touring Aircraft Desktop Wood Model Large" is in sale since Saturday, July 6, 2013. 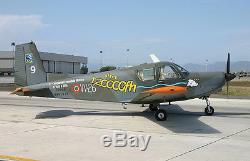 This item is in the category "Collectibles\Transportation\Aviation\Private Aircraft". The seller is "planemuseum" and is located in Metro Manila, Philippines. This item can be shipped worldwide.